Edited: November 27, 2009 - Added Monster 9 page information with date and time. Edited: December 24, 2009 - Added information found by Ube in regards to a list of competitors. For all of you who stayed up to watch Sportsman # last year (sorry.. I was too burned out to blog about it) and read about it on Ube's blog (he has several posts on it including pictures from the 2009 Sportsman #1) there is great news!! For those who have no idea what this is.. Sportsman is a TV game show on TBS (Japan) that is also produced by Monster 9 (creators of one of my favorite shows - Sasuke) and shown sometime on or around New Year's Day. With the announcement that Sasuke 24 is airing for over 6 hours on New Year's Day and the fact that Celebrity Sportsman has been canceled for 2 years in a row... (The last champion was Wakky ワッキー) we all feared that this was the end of Sportsman #1. Previous winners include 池谷直樹 Naoki Iketani, Paul ANTHONY Terek, ケイン・コスギ Kane Kosugi and current defending (and 3 time) champion 宮﨑大輔 Daisuke Miyazaki. I sent a few emails to M9 recently about fans thinking the show was canceled. In the past I'd get an email back but recently they immediately post something on their website to confirm or deny something. It happened again. I checked the Sasuke Mania website and lo and behold it was there! This page will update with new information as it becomes available! The decision has been made to broadcast Sportsman#1 in January of 2010. There is a great deal of drama in the show that gave birth to the gigantic vaulting horse "monster box". In regards to that, we will do a big collection of things you want to see one more time from Sportsman#1. We'd like to show all of your requests that we collect on the show. We'd be very happy if you were to write a detailed message concerning the reason why you want to see this specific part again. EDIT! : Okay! So to recap! They are showing Sportsman #1 2010 edition! January 7, 2010. Similar to the Sasuke 24 announcement, they give a form for you to fill out and then it just gives examples of requests and asks for your reason and email address. I'm not sure when they will show this particular recap show but they are doing 2 this year. Sasuke and Sportsman. In the meantime I'm excited! P.S. I'm sure some mention will be done in memory of a competitor that competed in the last Sportsman #1. 三沢光晴 Mitsuharu Misawa, NOAH Pro Wrestling Legend died June 13, 2009 after suffering a heart attack during a wrestling match. Sportsman No. 1 will be on January 7th, 2010 from 19:55 to 22:48 on TBS. This is not a regular Sportsman No. 1 competition. It is going to be a history show/retrospective plus a 50 man Monster Box competition. Edited: December 9, 2009 - Taping is complete and additional airdates of preshows added. Edited: December 12, 2009 - Ube found details of additional airdates. Edited: December 26, 2009 - Added the Muscle Park page with all the dates and times confirmed. Please bear with the length of this post.. it's a lot of information to absorb.. time-wise and show-wise this will be the biggest Sasuke to date! For a preliminary list of competitors please go to the "So excited for Sasuke 24" post. Things have been pretty surprising ever since Monster 9 officially unveiled their website Sasuke Mania! For starters, they announced Sasuke 24 back in October! Yep.. just a few weeks after the end of Sasuke 23! Thanks scnoi for finding it.. It came online at around 2 pm'sh my time in the East coast which had to be friggin 4 am in Japan.. (someone is working late..).. I was just there too.. LOL I had originally thought they were talking about a taping date for Sasuke 24 but I was totally off. (similar thing happened back for Sasuke 23 when we originally thought it was October thanks to a screw up with Google Translator). Thanks Ube for the help! Here's the new information. As per Sato Hiromichi 佐藤弘道 additional dates of 2 pre-shows exist. Ube was able to find more information from his local affiliate. "Battle of the first-ever New Year!! SASUKE2010 pre-show"
For those who watched the past few tournaments (Sasuke 21 Navi, Sasuke 22 Navi, Sasuke 23 Navi) this is the almost one hour special introducing the competitors of the upcoming show. Usually at the end they do a little bit of spoilers but the show overall is well produced and awesome for fans to get to know a little the competitors outside of Sasuke. I'm ecstatic it's almost 4 days before the tournament. Gives me time to blog about it and recover! For those who missed out on watching Sasuke 23 live it seems TBS is doing a rare rebroadcast of the tournament (complete with new commercials.. LOL)! Based on times it seems this is a little paired down from the original broadcast but still awesome for those who missed it the first time in Japan. This is the history special or the "best of Sasuke" as voted by fans show. (more information on how to vote see below) ***Please note: 17:15 will be a break for news for half hour and then be immediately followed by the main show! 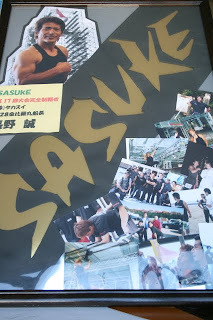 Sun has been determined SASUKE2010 program title and broadcast TV next New Year's Notice of Decision. "Battle of the first-ever New Year's Day!! SASUKE2010"
September SASUKE 1997 New Year's Day of Broadcasting is the first time since the birth. Across 30-minute news airtime is more than six hours. Please enjoy out! ！ ! Translation: An event from SASUKE that you would like to see one more time. This announcement was made on a side tab (the red banner just about this) on the front page of Sasuke Mania. Wanted to see it again 』SASUKE『 big scenes! 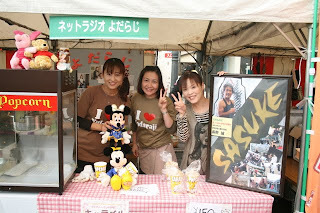 New Year's Day broadcast of the 2010 decision, SASUKE24 Annual Meeting! New Year's Day to commemorate the first battle, 『you』 recruiting big names to see the scene again SASUKE! Please let us know details of why the request! ※ us what one person can copy and apply it. 『Requests』 scenes see again SASUKE! This is by far one of the most interesting announcements to come out of Monster 9 in a while. I got an explanation as to wtf they are talking about. Here's the deal. On December 28th they will have a Sasuke Navi. On the 29th they will reair Sasuke 23. On the 1st before the main show will be the History Special. Either way, they are requesting from fans scenes from previous Sasuke's that you would like to see again. Remember that in Japan you don't get rebroadcasts like you do in other countries that air Sasuke/Ninja Warrior. Ube reminded me that they did this before when Sasuke Maniac was still on the air in the Kanto Region. This was the previous list from 2008. They are asking for fans to send in their ideas for possible runs they want to see again. They listed 3 (from Sasuke 12 - Yamada's failed run 2nd stage run where he finished but was disqualified), Sasuke 15 where Bunpei came back to compete after suffering heat stroke only to get to the 3rd stage and almost the final, and Sasuke 17 where Makoto Nagano achieved Kanzenseiha. Those are examples. They want fans to write in which they want and WHY they want that to be shown. They will pick between the favorites and who gets the most votes and will rebroadcast that run(s) in the pre-show. No confirmations as of yet. They are only asking for people to send in their favorite (only one) SASUKE moments (and the reason why). Write in which SASUKE, competitor's name and which part of that SASUKE. Why you chose that clip. Then click the gray box below all that. Details of that will come later I'm sure and when they do post that information I will update this page. Sasuke 24 was recorded on Tuesday, December 8! Can't wait for the end of December! 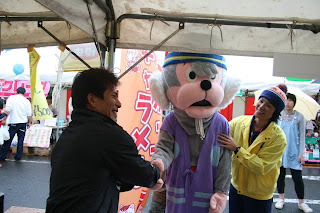 As I had mentioned on a previous blog, I was told the 5th interview with Makoto Nagano 長野誠 was incoming soon on yodaraji radio - which is a radio station located in Nobeoka (which absorbed Kitaura, Nagano's hometown) on the east coast of Miyazaki Prefecture. Being of course the local celebrity of the region he's been afforded the opportunity to be on the show whenever he wants :) Well they didn't disappoint! :D The November 8, 2009 radio interview was posted! I'll be updating this blog as I get more details as to what was said. This is Nagano’s fifth appearance on Yodaraji radio (all previous interviews are still on the website - top right of the main page). I blogged about his April, 2009 interview. 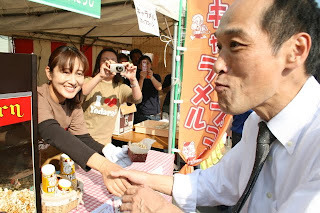 From the overall general impression it seems there was a local festival called "のぼるざるフェスタTogether2009" (Festa Noboruzaru Together2009) that took place October 31/November 1 in Nobeoka City. 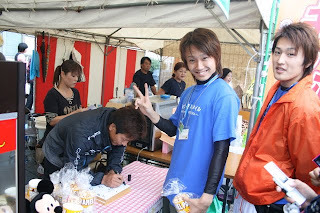 The hosts of Yodaraji put up a popcorn stand and had a spot specifically for Nagano to sign autographs. They had a great poster made for him and inserted what seems to be personal pictures he contributed (nice personal touch.. I want to see more of the pictures! .. ehem.. ). From what I can gather .. let's see.. personal picture of him posing with this fist pump in front of the Final Tower in Sasuke, the Levi Apology tour™ picture he posted on his website, a couple pics from the grand opening of the new version of Sasuke Park in Muscle Park I blogged about last year, personal pics I've never seen before of Takeda and Nagano in the MRT Beach competition this year and some odds and ends personal shots of his friends in Sasuke. The impressions of the just under 17 minute interview he covers a range of topics. I got a brief overview of the topics discussed in the radio interview. Thank you so much!! 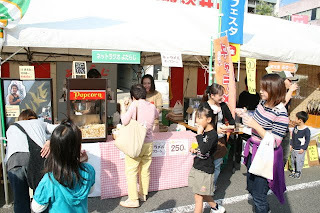 Anyway.. the start of the broadcast they mention that Nagano and family spent the previous week helping out at the Yodaraji booth at a local fair. He signed autographs and was very gracious in promoting the radio program. So right from the get go this interview happened most likely over the weekend of the 8th (when they actually posted the interview on their blog). They start off talking to him about the name of his son. By now we all know the name of his son - 塊王 (Kaiou) (his son's name in Hiragana かいおう) and pronounces it deliberately as to make sure they got it right. I hear a Kawaii.. so they think it's cute or at least the baby is cute. Nagano is very smitten with his baby. Most people say baby looks like Daddy, especially the skin color. (laughter all around.) "He is darker than most babies his age." (More laughter). Mystery about unusual kanji. Originally, he had wanted to use "Sea King" (海王) but after consulting a Shinto fortune teller, they were told the "lump" kanji will bring him more luck. It's actually very common for Japanese people to consult these religious folks for baby names. That kai (蝪・ means a clump of earth. The right side 鬯シ represents the circular shape of a spirit, like ones you see represented as fireflies or glowing balls. Then the left side 蝨・is earth/soil. From the you get "a round clump of soil." Talk turns to Sasuke. 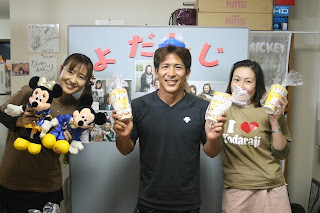 Miki, one of the ladies, didn't watch the last show. In fact, she usually doesn't watch them and Nagano gives her hell (good-naturely) about it. Nagano said he was confident that if he passed that Stage One obstacle (Most likely referring to the Slider Jump), he would go all the way. He said if he had two more seconds, he would barely pass. If he had three more seconds, it would have been plenty of time. He then talks about getting old, and how it's the lower body that gives out first. Upper body strength is easier to work on. Even he was surprised at how he needed an extra try at the Warped Wall. He obviously dislikes the veteran vs. newbies storyline. He says Sasuke is not a competition. He wants everyone to do well. He just enjoys it when people do well. He says the pressure of wearing 100 is enormous. There is pressure to carry the show when no one does well. Then when lots of people do well, there's the fear of being the only one left behind. They talk about the next Sasuke which will be taped in December... a possible air date is January 1... but Nagano says the date is not set yet. January 1 is a very prestigious time slot in Japan. Then he talks about the popularity of Sasuke worldwide. Ta-chan mentions that she gets regular e-mails from abroad. Nagano says he gets regular e-mails through his webpage. "In fact, all the contacts I've had lately are from abroad." She asks whether they are all declarations of love and he says no. "Most people just wish me luck. Some tell me how I have inspired them to health or to try things. It's nice and really makes me happy to hear things like that."